Yesterday saw two sides of my life that one might see as polar opposites. Some days I think I have a Jekyll/Hyde persona with regards to my interest or skills. It doesn't make me ashamed of who I am and certainly one side is not better than the other. I just find it funny when both sides happen to occur on the same day or the same week. I was slated to help a couple of guys cut down some trees yesterday. The trees were dead ash trees, victims of the Emerald Ash Borer, and they were over forty feet tall. 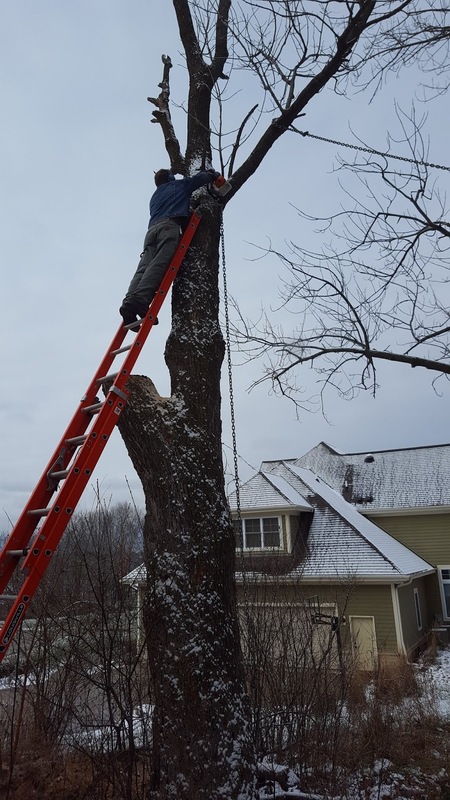 I've cut wood with my friend Claude before, so I knew we would be safe and smart about it, but there is always my sense of trepidation and excitement that go with running a chainsaw and a little dangerous tree felling. So we got to it and focused on the biggest problem tree. Claude had the chains hooked up when I got there and he was trying to take the first of two main trunks. After some key notches were cut and the chains were tightened, the first fell with a great crash, a perfect cut. While he and Kevin started setting up the second hoist & chain, I started buzzing the felled section into 15" chunks. There is nothing as much fun or as dangerous to a hack like me as running a chainsaw. It is nothing short of a manly adrenaline/testosterone rush. It sounds stereotypical - and probably is - but it makes me feel manly. A real lumberjacky feeling. Which is funny because I work a desk job and most days I'm pushing a mouse and typing a lot. So, to a white collar dude, this is some cool stuff. After a few hours of noise, two-stroke exhaust and a lot of back breaking lifting, I had to take off to tend to the other side of my life. 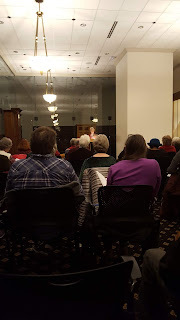 I drove to the Milwaukee Public Library for a poetry reading hosted by the Wisconsin Fellowship of Poets. They hold a reading locally every year for those poets who contributed to the annual calendar that they publish and sell. The event was well attended, largely by the over 50 crowd and was one of quiet attention to each person who got up to read. Each poet was given quiet, appreciative applause at the end of their couple of poems. The poems focused on the "People of Wisconsin," so was applicable to everyone there and, as I said, it was a quiet, cultured affair. As I sat there though, I was brutally aware of the disparity between the two activities of my day. It sounds like a good title for a book. I'd like to think all of this makes me a little more three dimensional as a guy. I'm not ashamed of any of it. It does give me pause to laugh at the dichotomy of it sometimes though. At the same time, it's who I've become and I ain't apologizing to anyone.